Not to be confused with Gaza. Giza is the third-largest city in Egypt. It is located on the west bank of the Nile, 5 km (3 mi) southwest of central Cairo. Along with Cairo Governorate, Shubra El-Kheima, Helwan, 6th October City and Obour, the five form Greater Cairo metropolis. The city of Giza is the capital of the Giza Governorate, and is located near the northeast border of this governorate in coordinates. It is located right on the banks of the River Nile. The city's population was 2,681,863 in the 2006 national census, while the governorate had 6,272,571 at the same census. Its large population made it the world's second largest suburb in 2006, tied with Incheon, South Korea and Quezon City, Philippines, second only to Yokohama, Japan. Giza is most famous as the location of the Giza Plateau: the site of some of the most impressive ancient monuments in the world, including a complex of ancient Egyptian royal mortuary and sacred structures, including the Great Sphinx, the Great Pyramid of Giza, and a number of other large pyramids and temples. Giza has always been a focal point in Egypt's history due to its location close to Memphis, the ancient Pharaonic capital of the Old Kingdom. Its St. George cathedral is the episcopal see of the Coptic Catholic Eparchy of Giza. The Great Pyramid of Giza at one time was advocated (1884) as the location for the Prime Meridian, a reference point used for determining a base longitude. "Mn Nefer" (Memphis, in Greek), which means "the beautiful wall" in the ancient Egyptian language, the capital city of the first unified Egyptian state since the days of Pharaoh Narmer, lies nearly 20 km (12.43 mi) south of Giza. Giza's most famous archaeological site, the Giza Plateau, holds some major monuments of Egyptian history. Once thriving with the Nile that flowed right into the Giza Plateau, the pyramids of Giza were built overlooking the ancient Egyptian capital city of Memphis, across the river from modern day Cairo. The Giza Plateau is also home to Egyptian monuments such as the tomb of Pharaoh Djet of the First Dynasty, as well as that of Pharaoh Ninetjer of the Second Dynasty. The area in what is now Giza served as the necropolis of several pharaohs who ruled ancient Egypt, during the 2nd millennium BC. Three of these tombs, in the form of giant pyramids, are what is now the famed Three Pyramids of Giza. 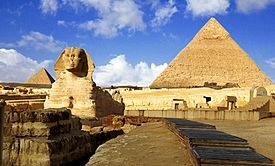 As ancient Egypt passed under several conquests under the Persians, Greeks, Romans and Byzantines, so did the area in what is now Giza. A Byzantine village named Teresa, located south of Giza, existed before the Muslim conquest of the region. 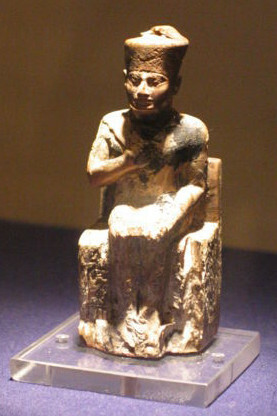 Native Egyptians called the area Tiperses (also Tiperses Nbabylon (which most likely refers to Babylon Fortress but may as well refer to Babylon in Mesopotamia) Tipersoi, Perso), which may correspond to Persians (as the name may be literally translated as "Persians of/from Babylon"), but the exact origin of this name remains unclear. As Muslims of the fledging Islamic caliphate went on with their conquest of Egypt from the Byzantine Empire beginning in 639 AD, three years after their victory at the battle of Yarmouk in 636 AD, they conquered all of the land by the time they have captured the city of Alexandria in 641 AD. 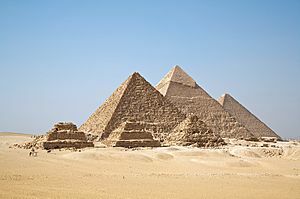 A year later in 642 AD (year 21 in Islamic calendar), they founded the city of Giza. Its name, al-Jizzah in Arabic, means "the valley" or "the plateau", pertaining to the area's topography. Transportation in Giza comprises an extensive road network, rail system, subway system, and maritime services. Road transport is facilitated by personal vehicles, taxi cabs, privately owned public buses and microbuses. Giza shares with Cairo a subway system, officially called the "Metro (مترو)", a fast and efficient way of getting around. An extensive road network connects Giza with 6th of October City, Cairo and other cities. There are flyovers and bridges such as the 15th Giza traffic is known to be overwhelming and overcrowded. 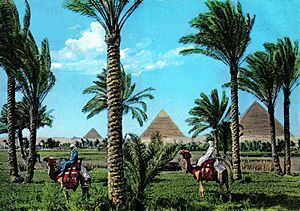 Giza experiences a hot desert climate like arid climate (Köppen: BWh). Its climate is similar to Cairo, owing to its proximity. Wind storms can be frequent across Egypt in spring, bringing Saharan dust into the city during the months of March and April. High temperatures in winter range from 16 °C (61 °F) to 20 °C (68 °F), while nighttime lows drop to below 7 °C (45 °F). In summer, the highs are 40 °C (104 °F), and the lows can drop to about 20 °C (68 °F). Rain is infrequent in Giza; snow and freezing temperatures are extremely rare. Up to August 2013, the highest recorded temperature was 46 °C (115 °F) on 13 June 1965, while the lowest recorded temperature was 2 °C (36 °F) on 8 January 1966. Giza's learning institutions include Cairo University, which was moved to Giza in 1924. The city is a hub of education and educational services not only for Egypt but also for the entire Mediterranean Region. Giza has numerous schools, kindergartens, and institutes of higher learning. The Cairo Japanese School, a Japanese international school, is in Giza. The Deutsche Evangelische Oberschule, a German international school, is located in Dokki in Giza. Previously the Pakistan International School of Cairo had its campus in Giza. Giza Facts for Kids. Kiddle Encyclopedia.